This is a drawing of a Northern cat-eyed snake on yellow toned calligraphy paper. This snake lives in the southwestern part of North America and is related to similar species in Central and South American rainforests. I was intrigued by the unusual shape of the head, much larger & rounder than the slim body. 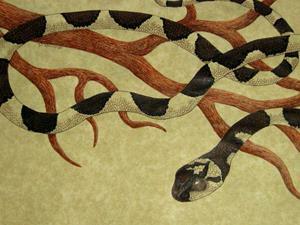 The branches were fun to do, but mapping them out to fit the drapes of the snake's body was tricky. Included in the 2013 Cold-Blooded Creations Exhibit in Florida. 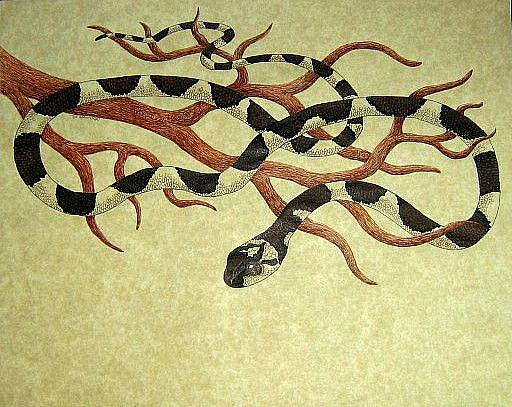 As an entry to the Opposites show here on EBSQ, I was thinking of the contrast between the smooth flexibility of the snake and the stiffness of the tree limbs.